We now know this is a Kamar brand donkey. What a wonderful site. I am inspired to tell you my story. I am a child at heart, even though I’m 34 years old. Stuffed animals were my refuge from the pains of childhood. They were the friends I never had in real life. I lost my best “friend” in 1979 when I was 5. 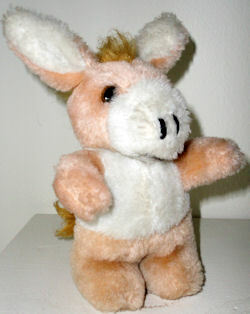 My stuffed animal “lovie” was named Donkey Hoatie. Like Don Quixote, but simplified by my sister Laurel for my 5 year old kid mind. He was a Christmas gift in 1978. I lost him at the Manx Hotel in San Fransisco- we gave him a bath and hung him up on the towel bar to dry. I forgot to pack him in the suitcase. I have no pictures, but remember him vividly- I’m constantly describing him to my girlfriend who has looked all over to replace him for me. No luck. I think he was about 6-7 inches tall. He was a donkey or horse but standing as if he were a person- sort of. He was orange with a white tummy and mane. His ears stood straight up maybe with wire in them. He had a red hat maybe and was wearing a vest. He had a big snout which was also white at the front. I think he had brown pants. I would like very much to find out who made this animal. With the hope I could find him again. Do you think you could find him or may know of others who may know? I would like my old friend back again. Here’s GT’s original drawing we had posted. He did a great job of rendering a lovie he hadn’t seen for almost 30 years , didn’t he! Is Donkey heavy? If it is, then it must be filled with ground nutshell = Dakin, Gund, or Russ. If the fabric is stiff and filling is styrofoam/ light = Carnival giveaway. Possible maker for Carnival Giveaways from that era is Superior Toy Novelty, ACME, St. Louis Carnival Supply. If you remember what color the tag was, that will be a big help for identification. Ana. PS: Soft plush and not heavy/ fiberfill could be made by Dakin, Gund, Russ, Animal Fair, or Knickerbocker. Knickerbocker and Gund often put wires in ears until mid 70s. If your memory is correct about the tag, then the maker will be Applause or Russ Berrie (70s-80s Applause has cloth tag, Russ is silk tag). Could this be Quick Draw Magraw maybe? Mcgraw — quick draw something like that….he is white and western. If you have a large bookstore close by, like a Barnes & Noble or Books-a-Million, you might try looking in their Collectibles/Antique section for a toy book. But the odds of finding it in a company catalog are all but nil. Sorry. Pssst – Please try to get in the habit of adding the post code to your comments. I forget, too, but every one that has it is one less I have to mark in my files. I have a stuffed animal which has its original tags and he is very similar to what you are describing. 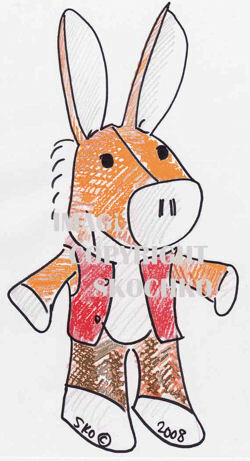 He is a yellow or light orange color and is wearing a red vest. he is made by Animal Fair and his tags are dated 1976. I could gladly send you a photo of the one I have if you like or if you are still looking.